Known for its tranquil environment and stunning beaches, those who choose to vacation in Domincal or Uvita appreciate the more natural experiences in life. The Real Deal Tours has the perfect way for you to explore nearby Manuel Antonio National Park…on board one of our well-groomed equine friends on one of our horseback riding tours departing from Uvita & Dominical. Our Dominical horseback riding tours leave no carbon footprint which is such an important part of ecotourism in Costa Rica, the pride of the tour industry. So saddle up and enjoy the beautiful beaches, Tocori waterfalls, and lush jungles that surrounds Costa Rica's South Pacific coast while leaving behind nothing but hoof prints. At the heart of our Manuel Antonio horseback riding tours is a truly authentic Costa Rica gem: Don Gilberto's Ranch and his personal family touch. Our Tico friends will make you feel welcome and are enthusiastic to share their knowledge of the local flora and fauna and years of traditional ranching in Costa Rica. Our horseback riding tours departing from Dominical & Uvita can take your mind off of the hustle and bustle of daily life and make for the most memorable part of your Costa Rica vacation. 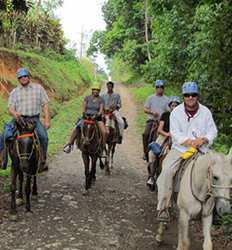 Booking with The Real Deal Tours you can be sure you are getting the best deals in Costa Rica on the best horseback riding tours in Domincal. Check below for all the horseback riding tours departing from Domincal & Uvita and choose your equestrian adventure today.